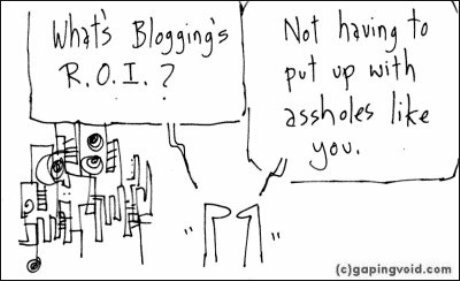 Is ‘blog’ a 4 letter word? Unfortunately, a few people (who matter), think so!! I wish they realised the value of blogging. I mean people like Jonathan Schwartz (President, SUN), Jeremy Zawodny (mySQL Guru, Yahoo), Robert Scoble (ex-Microsoft, PodTech.net), Matt Cutts (SEO geek, Google), Om Malik (GigaOM), and Michael Arrington (TechCrunch) are most famous because of their blogs. Ok, not Schwartz. But you get the point!! Google, Yahoo and Microsoft use blogs as a PR tool and even use it to communicate with developers and uers of its services. A lot of Indian (I know about Infosys for sure) companies use employee blogs to enhance communication between its employees. I hope some people update their views on blogging. And soon. Meanwhile, I leave you with another Gaping Void cartoon. Update: An estimated 8% of Fortune 500 companies have official blogs!! You can check out the list here.